Doughnut Charts, as the name makes you think, has a doughnut-shaped figure. They are basically the same as Pie Charts, with just a hole in the middle. It is often viewed as a modification to pie charts. If you look at the pie chart, your focus will go to the center of the chart and you will consider the chart’s entirety. Doughnut charts, on the other hand, eliminates the need to compare the size or area of the slice and shifts the focus on the length of the arc, which in turn is easy to measure. Doughnut charts are like stacked bar charts, curled around itself, such a way that both ends meet and it forms a circle. This chart is preferred over the pie chart because of its data intensity ratio and space efficiency. The hole in the middle of this chart is used to convey extra or additional information, like the total number of data or labels of the arc. 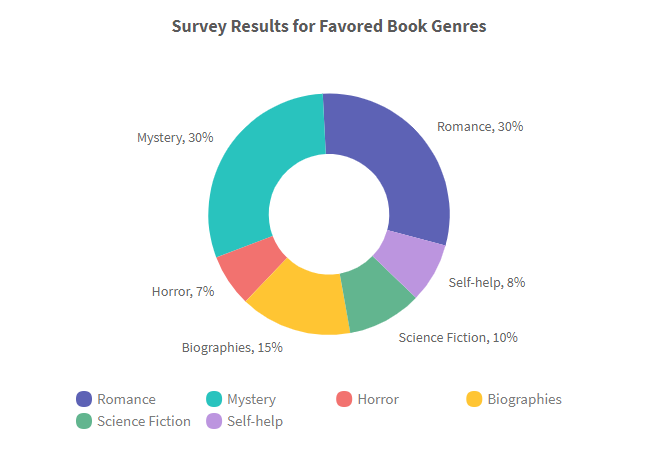 An example of a doughnut chart is given below, it shows a survey of book sales in different genres in a bookstore. The data in a worksheet that can be arranged in rows or columns are the only ones that can be plotted into a doughnut chart. Just like Pie charts, doughnut charts too, give a part to the whole relationship. That is, the sum total of all the arc that represent categories, form the whole data. Although unlike the pie charts, multiple series can be represented in doughnut charts. The number of rings can be increased. The more the number of series, the number of rings can be added to the chart. In case, percentages are shown in the data labels, each ring will add up to be 100% in total. For example, let’s take the working of an Ad words account for a company. Their campaign can be represented in the form of a multi-level doughnut chart. Doughnut charts can also be drawn in 3-D, to make the chart look visually appealing and leave an impact on the audience. When you draw the doughnut chart, further changes can be made to it by modifying the slices. The size of the slice can be increased or decreased based on our convenience by increasing or decreasing the hole size. The slice can be pulled out of the chart and be analyzed separately. Each slice of the doughnut chart can be rotated too, in order to analyze the chart from a different view. Doughnut charts can also be modified by adding data labels and text boxes. Multiple groups and categories of the data can be denoted. This gives better visualization and understanding to the readers of what each slice represents. An example of such a modified chart is illustrated below. This doughnut chart shows the sales percentage in three countries over 2 years. With the help of labels and text boxes, the data represented pictorially is easily understandable. Doughnut charts have a simple structure and are easy to draw. These charts are reader-friendly and can be easily understood by even a non-professional. The data values in a doughnut chart can be inserted or changed according to our needs. Doughnut charts can be drawn in different types and colors. With the help of texts boxes and label insertion, the readings are easy to understand. 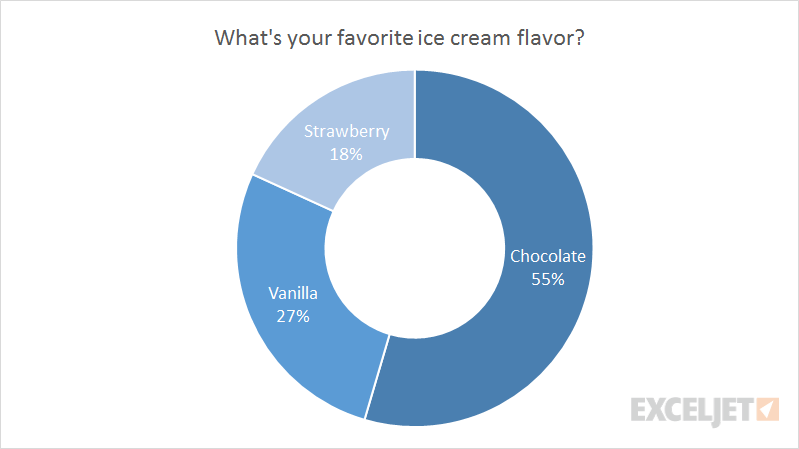 Unlike pie charts, multiple data sets can be displayed using a doughnut chart. 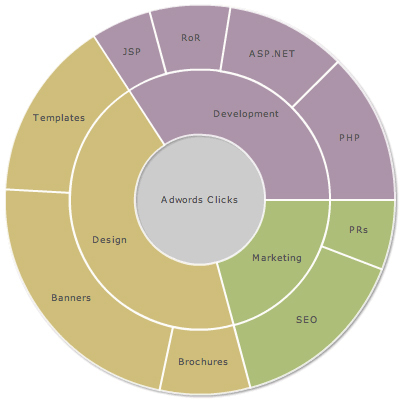 Total data value, data labels or any additional information can be placed in the hole of a doughnut chart. Doughnut charts are good to use when comparing sets of data. These charts require minimum additional explanation. These charts can be visually checked for accuracy of data distribution. To highlight the data points, one can manipulate the pieces of the chart. Size of the whole chart can be made proportional to the data that is to be represented. When the doughnut chart is drawn in excel, the percentage values can be calculated automatically. These charts work best with less number of data. For example, suppose a survey is taken for a class, to know their favorite ice-cream flavor. This data can be represented tidily in the doughnut chart. In case, there are too many slices or arcs, the chart becomes messier to read. To draw data from visual analysis can often cause errors in understanding the data. It is hard to determine the size or length of arcs unless they are near each other. Negative data cannot be identified unless marked. It is not advised to use a doughnut chart when negative values are included. The inclusion of 3-D effects makes the data more complex to understand. Only data which have below 10 categories are suitable for doughnut charts. It may be good for comparison of data but when it comes to analyzing data, it is hard to grasp all the information in one place. You cannot determine the exact data values from looking at the graph. This chart can be easily manipulated to provide false information. Data distribution is limited to parts of the whole pattern. Doughnut charts are not preferred when data changes happening over time are to be displayed. These were some of the features that make Doughnut charts stand out among other charts. Hope this helped you with your data.